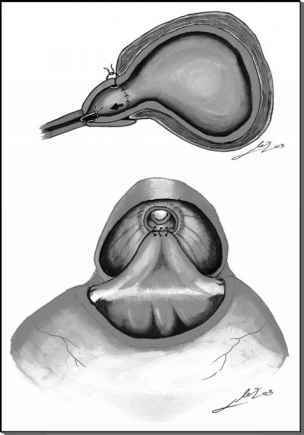 Compared to open surgery, all laparoscopic techniques mentioned above have limitations, including a steep learning curve and the requirement of significant laparoscopic expertise. In all the reported series, operative time was significantly longer than the conventional open surgical adenomectomy. Compared to open surgery, laparoscopic techniques may result in decreased blood loss, shorter hospital stay, shorter postoperative length of catheterization (range 3-10 days), less postoperative pain, lower morbidity, and shorter convalescence. The ability to precisely transect the prostate adenoma at its apex under magnified laparoscopic visualization, while maintaining the integrity of the sphincteric zone of the membranous urethra, is superior compared to open surgery. 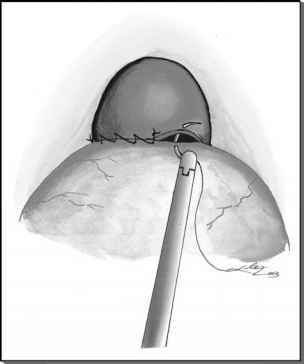 Unlike open surgery, the surgeon does not insert the index finger in the open capsule nor are any intravesical retractors placed, thus decreasing the risk of capsular trauma and potential capsular avulsion (18-21). FIGURE 7 ■ Trigonization. The trigone is advanced into the floor of the prostate fossa or into the posterior wall of the urethra. FIGURE8 ■ The prostate capsule is suture approximated anteriorly. Bladder entry also allows the concomitant management of any coexistent intravesical disease such as bladder calculi. A benefit of this technique, similar to open surgery, is the nearly complete removal of the entire adenoma thus achieving complete clearance of the obstructive symptoms. Complications of transurethral surgery, such as the transurethral resection syndrome, which occur due to prolonged resection times frequently noted with the larger glands do not occur during laparo-scopic simple prostatectomy. Advantages of the technique proposed by van Velthoven's include its preperitoneal nature, the relatively short operative time (2.4 hours), and limited blood loss (192 mL). However, it is our feeling that a direct capsulotomy over the anterior surface of the prostate gland potentially transgresses the subcapsular venous plexus and contributes to increased blood loss. In van Valthoven's series, the average specimen weight of the excised prostate was equal to only 50% of the gland weight estimated on preoperative transrectal ultrasonography (20). We described an extraperitoneal technique for laparoscopic simple prostatectomy in 17 patients. Blood loss was 516 mL, operative time 156 minutes, and average specimen weight was 72 g, representing 77% of the preoperative transrectal ultra-sonography estimated weight.